Hey, everybody has been talking “New Year’s resolutions” so why not! Just kidding…but now is a good time to tackle of a couple of compliance things to make sure you are kicking off the New Year on the right foot. 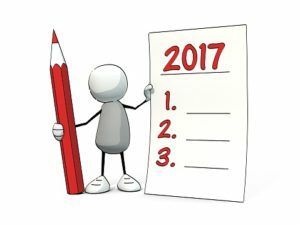 With everything else that comes with the New Year and end-of-year paperwork (like those W2s and Form 1094s and 1095s), the start of the new calendar year is a good time to give other parts a good look-over, just to make sure everything is up-to-date and you don’t get caught half-way through the year. 1. When was the last time you went and checked your Labor posters? Now is a good time to check to make sure you have the latest AND that you have them posted where employees can see them. Many people make sure they are visible in their “HR” department but what about employee breakrooms? We had a lot of changes last year from classifications and minimum wage increases. Make sure all of your workplace posters are up-to-date and the correct size. Check with your state labor department for any industry-specific poster requirements that may apply to your business. Note that certain localities may also have posting requirements. Psst…. *You can visit the Federal and your state’s Department of Labor websites and download the new posters for free. 2. Put together an Employee Information Package. Were they any changes to your benefits? How about those annual required notices, such as summary plan descriptions (SPDs) or COBRA- and FMLA-related notices? Remember that employers are required under various laws to provide employees with certain information about their benefits and responsibilities. While employees may be less interested in the annual required notices (yes, you still have to give it to them! ), they will be very upset if they go to use their benefits this month and find out their FSA card is not valid or insurance deductibles changed. Even if it is included in information that went out when the plan changed was being finalized, a quick snapshot memo of “Changes you need to know for 2017” brings it back to their attention so they can’t come back later and complain that you never told them. 3. When is the last time your reviewed your Employee files? Employers are required to maintain certain types of employee records in order to comply with applicable law but many only are required for a certain number of years. What not declutter around the office! Take time to review what documents you need to have paper copies of and what you can scan and save. Check employee files to make sure your I-9s are up-to-date (and using the current form) with unexpired IDs. Make sure each of your employees has an Emergency Contact sheet and that its not older than 3yrs (in my opinion) as contact names may not change but phone numbers frequently. Make sure you have insurance beneficiary forms for all your employees that you are providing Life insurance and 401k plans for, including: make sure they signed it! So many employees worry so much about getting their beneficiary information correct that they forget the easiest part of all. 4. Review your current policies and procedures. Again, a lot of employments laws changed last year or are slated to change during 2017 so this is a good time to review your current Employee Handbook as well as company policies and procedures. Previous postPerformance Review Time – Should You Keep Doing Them?